A reintroduction to flat, short track racing, the NASCAR Sprint Cup Series is set to compete on the smallest track since Dover in May. The 1.058-mile oval of New Hampshire Motor Speedway hosts its first of two races in 2011 for North America's premier stock car racing organization. 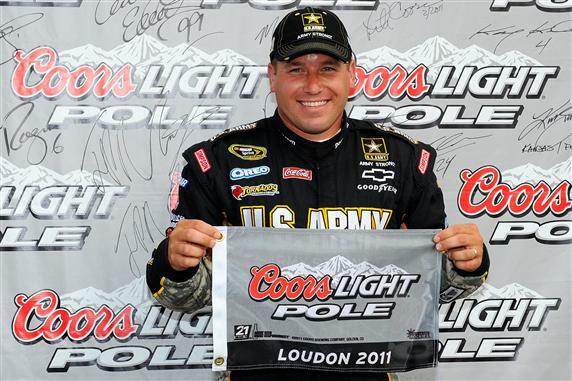 In qualifying for the NASCAR Sprint Cup Series Lenox Industrial Tools 301 at New Hampshire Motor Speedway, Ryan Newman piloted the #39 Stewart/Haas Racing Chevrolet to his 5th pole at the race track. Team owner Tony Stewart will start alongside Newman in the #14 Chevy. The NASCAR Sprint Cup race team is still seeking their first win for the 2011 season. In the second row, David Reutimann's #00 Toyota and the #22 Dodge of Kurt Busch line up for Sunday's race in Loudon. 2010 winners at the New Hampshire Motor Speedway start reasonably down on the grid for the Lenox Industrial Tools 301 race. Recording the 12th fastest time in qualifying Friday the #33 Richard Childress Racing Chevrolet, Clint Bowyer is still hunting his first win of the 2011 season. Past winner of the early summer event Jimmie Johnston is starting well down in 28th spot. The New Hampshire Motor Speedway was the scene of Ryan Newman's first NASCAR Sprint Cup Series victory in 2002. That year driving for Penske Racing through his first season, Newman's momentum from the New Hampshire race win allowed the Indiana native to beat Jimmie Johnson for Rookie of the Year. While qualifying position is important at New Hampshire, 8 of the 32 previous NASCAR Sprint Cup races held at the oval were won by a driver who started outside of the top-20. Closing from the deepest position of 38th place to win in July of 1999 was Jeff Burton. The NASCAR Sprint Cup's Lenox Industrial Tools 301 race is scheduled for 1 pm eastern time on Sunday.